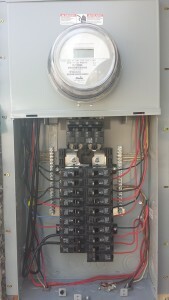 Electric Services | Moonlight Electric Services, Inc. Many of the Los Angeles homes have been built more than 60 years ago and requires wire updates to be more safe and reliable and to accommodate for our changing energy usage. We have been in the electrical field for over 25 years and we have seen many wiring issues that are hazardous if left unresolved, most fires which occurred due to electrical problems, were caused by either old wiring, or outdated electrical panels. We highly recommend to have your home inspected by one of our certified electricians as we are experienced in trouble shooting and solving any electrical problems you may experience in your home, we are educated and follow the latest building and safety codes and we are experts in providing you with a complete house rewire, and panel upgrade that will suit your usage and follow the latest electrical safety codes. As a proud American electrical contractor, Moonlight Electric Services, Inc. believes that service and safety are a priority. Our company is Licensed, Bonded and Insured in the state of California, and we provide workers compensation to all of our employees. We believe that our customers deserve the best, in order to achieve that, we always strive to provide them with the best quality labor, materials and service. We specialize in many different electrical solutions, and will be glad to answer any questions you may have both by phone, and e-mail. Our electricians will always complete your project according to the newest electrical codes and regulations in order to provide the highest level of safety and longevity of installation. No matter what the electrical problem is, our electrician will help you find the solution, guaranteed. We take pride in our work, and are very comfortable with the quality of service we provide. Served Areas: Agoura Hills, Beverly Hills, Brentwood, Burbank, Canoga Park, Chatsworth, Culver City, Calabasas, Canyon Country, Century City, Encino, Glendale, Granada Hills, Hollywood, Lake Balboa, Los Angeles, Malibu, Mission Hills, North Hollywood, Northridge, Pacific Palisades, Pacoima, Pasadena, Reseda, San Fernando Valley, Sherman Oaks, Sylmar, Stevenson Ranch, Studio City, Sun Valley, Sunland, Tarzana, Thousand Oaks, Toluca Lake, Topanga, Tujunga, Universal City, Valencia, Valley Village, Van Nuys, Venice, Ventura County, West Hills, West Hollywood, Westlake Village, Winnetka, Woodland Hills.